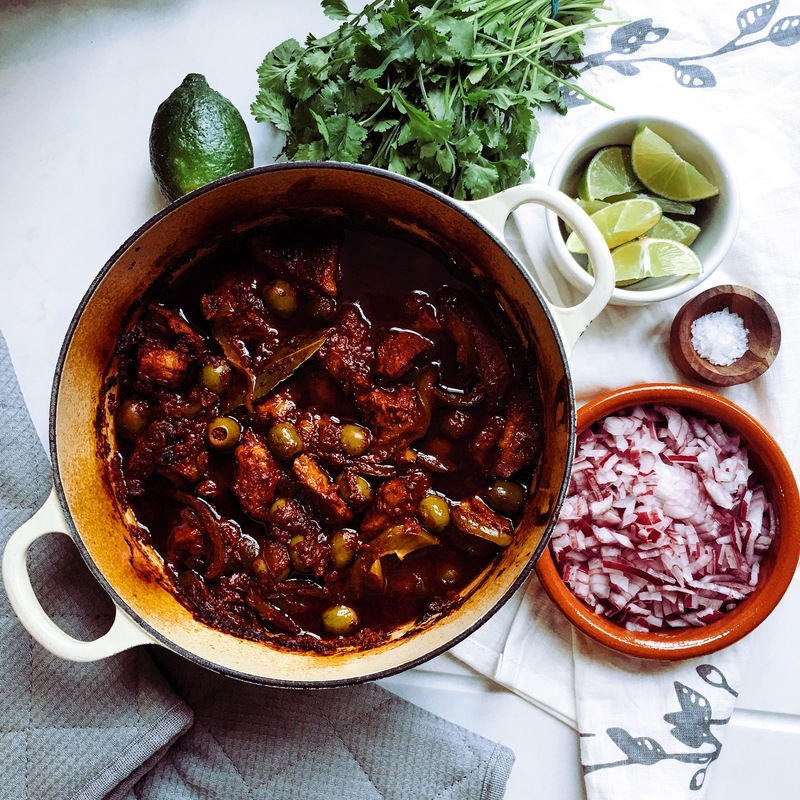 Today’s recipe is a quick lamb Mexican stew, called Birria, although some people would say it is a barbacoa, anyway, how ever you want to call it, it is utterly delicious. I love making this recipe when I want to impress my guests without spending too much time in the kitchen. All I do for this dish is cut the veggies, prepare the marinate, cut the lamb into pieces, marinate it, cook it in the oven and taraaa!! Done in 2 hrs ish. Then chopped onion and coriander, fresh warm corn tortillas and eat the birria in tacos. Eat as much as you can! Preheat the oven to Gas mark 6 or 200 C degrees then when you put the birria in the oven turn it down to gas mark 3 or 160 C.
Clean the chillies, take stems and seed off, place them in a sauce pan together with the tomatoes cut in half, onion and 1 1/2 cups of water. Cook for 7 min. Then put everything in a blender, together with the garlic, cumin seeds, clove, pepper corns, lamb stock cube, tomato pure and salt. Blend until getting a smooth salsa. Set aside. Cut the meat into cubes. Keep the bone to the side. Then pour the salsa marinate over the meat and add the bay leaves, vinegar and beer. Leave to marinate for at least one hour. Place the meat in a large casserole dish (dutch oven) together with the bone, green pepper strips and olives. Put the casserole in the oven for approximately an 2 hrs, check if the meat is tender and falls apart easily. When the meat is ready, just shredded with two forks and serve in tacos, add some fresh coriander, chopped onion and spicy salsa. Enjoy it with a nice cold corona!